We take great pleasure in announcing that the Executive Board and Academic Council of the KU Leuven have awarded to art historian Lorne Campbell (UK) an honorary doctorate of the Faculty of Arts. 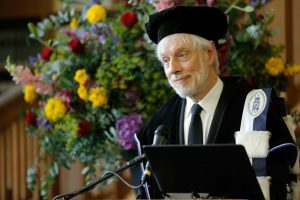 On 20 October 2016, the KU Leuven offered a doctorate honoris causa to Lorne Campbell (1946). Until his retirement in 2011, he was George Beaumont Senior Research Curator at the National Gallery in London. Previously (1974-1996) he taught at the Courtauld Institute of Art. He is one of the most distinguished and esteemed historians of the arts of the Southern Netherlands in the fifteenth and sixteenth centuries. He was the co-curator of the exhibition Rogier van der Weyden. Master of Passions held in 2009 at the M – Museum Leuven; and he was co-author of the catalogue. The honorary doctorate is awarded to Lorne Campbell in the context of the Utopia-project, curated by Professor Jan Van der Stock.